I use scented laundry detergent. If you are sensitive or allergic, you might want to consider this. I n s e a m : 2 9 I n c h e s.
AG Adriano Goldschmied The Legging Ankle Jeans. Super Skinny Ankle. Care: Machine Wash. Across at hem 4.5". Inseam 30.5". 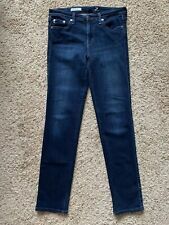 A G Stilt 28 Jeans Blue Stretch Denim Fray Bottom Designer Perfect Skinny Slim . Condition is Pre-owned. Shipped with USPS Priority Mail. I cut bottoms to update. Wash: Bellatrix. Model: The Farrah Skinny Ankle. 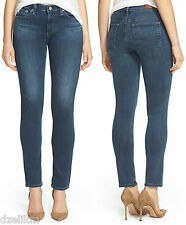 A high-rise skinny jean is cut to an ankle-skimming length in faded dark indigo denim. Skinny leg. Composition: 99% Cotton, 1% Polyurethane. inseam 29". Size: 28 Regular. Inseam - 29". Waist (across laying flat) - 15" ( 30" around). Ankle opening (flat) - 5" ( 10" around). Five-pocket design. Zip fly, button closure. Skinny jean with a high-rise waist and a narrow leg. Front Rise: 9.5". Inseam: 29". AG Adriano Goldschmied The Stilt Cigarette Leg Women's Jeans Size 30R 30 EUC! 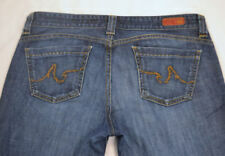 AG Adriano Goldschmied The Stilt Cigarette Leg Women's Jeans Size 30R 30 EUC!. Condition is Pre-owned. Shipped with USPS Priority Mail Flat Rate Envelope. AG Adriano Goldschmied dark blue (almost looks black) The Legging super skinny fit pants. Leg opening: 5 1/2". These jeans are 55% viscose, 25% cotton, 18% polyester, 2% elastane and in excellent pre-owned condition. Style: " The Stilt" Cigarette Leg. Any darker areas seen in the photos (especially in the crotch area) are shadows caused by the lighting and NOT a stain or discoloration on the jeans themselves. Inseam: 29" from crotch to the bottom of the leg. Inseam: 29". Waist: 28". Rise: 7.5". Fit: Boot cut - petite. Rise: Low – 8”. Leg Opening: 9”. Rise: 8”. Wash: Dark. Inseam: 29”. Style: 5-pocket. Material Cotton,Lycra. Color Grey,Grey. Type Jeans. Discover daily new arrivals in all seasons, sizes and styles that you can't find anywhere else. Item Details. 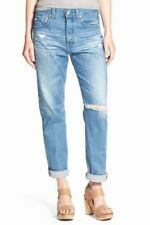 Size 29 Women’s AG Adriano Goldschmied Stevie Slim Straight Jeans USA MADE! Here’s a pair of stunning AG Adriano Goldschmied Jeans in the Stevie Slim Straight style. Indigo blue wash. These are excellent, with only minor wash wear in a couple spots. Main color(s): Distressed blue. Width at bottom of pant leg: 7". Width at top of thigh: 9 1/2". Fabric content: 98% cotton, 2% polyurethane. Back Rise: 12 1/2". Front Rise: 7 1/4". Inseam: 29". Waist: 31". Size Type: Regular Inseam: 29 Silhouette: Skinny & Slim Rise: Mid Material: Cotton Blends | Treatment: Medium Wash | Stretch: YES | Features: Zipper Closure. Very good condition. Black coated, looks like leather. 5 pocket, button, zipper closure. 80% cotton, 15% modal and 5% polyurethane, machine wash inside out tumble dry low. Made in USA. Inseam: 29". Great Condition! 98% Cotton 2% PU. Leg Opening: 12". AG The Farrah is classic skinny jean with a high rise for added comfort and/or style. Crafted from a soft, stretch velveteen fabric, the Farah high rise pant by AG features tonal stitching and brushed hardware. We are offering a cool pair of jeans from AG. The Zip-Up Legging is a skinny style in a medium blue wash. Size 26R. Measurements: Waist: 29" Inseam: 29" Rise: 7 1/2" The perfect addition to your wardrobe!. Jeans can also stretch/shrink from wear/wash. Good used condition with factory distressing on pockets, frayed distressed heels, and ripped knees, see pics for all details. - 10 year AG-ed denim. Color Turquoise. Type Jeans. Discover daily new arrivals in all seasons, sizes and styles that you can't find anywhere else. Material Cotton,Elastane. All details of the product have been included. Item Details. SML02468121423 in.24 in.25 in.26 in.27 in.28 in.29 in.30 in.31 in.32 in. PM24 in.27 in.29 in.31 in.